Under the arches in Kraków's main square. All photos by Kasia Dietz. 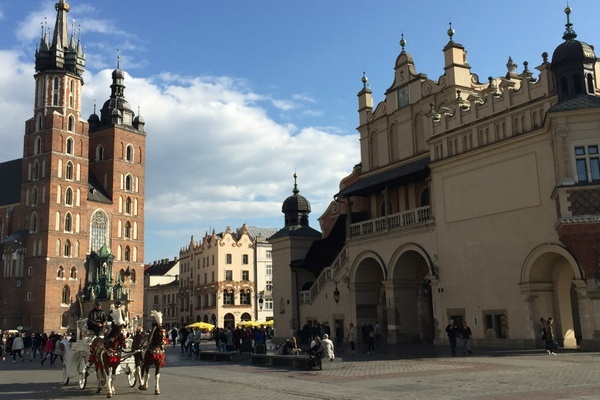 It's never "out with the old" in history-filled Kraków, but it's definitely in with the new. Kasia Dietz, a frequent visitor since childhood, takes note of the city's latest and greatest. 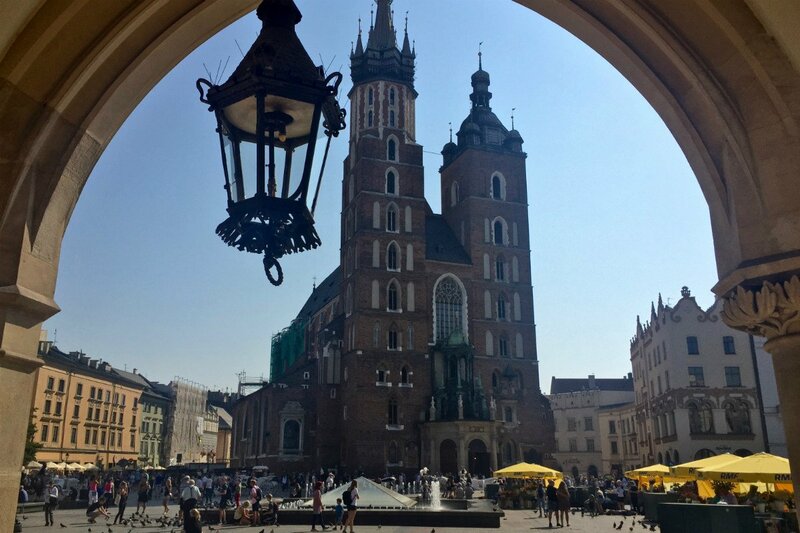 KRAKÓW — Kraków, Poland's former capital and once among the largest cities in Europe, has long and undoubtedly been considered an historic and cultural artifact. Its beauty and charm became even more evident when the Old Town and Jewish Quarter Kazimierz were designated UNESCO World Heritage districts in 1978. Another site to behold is Wawel Castle, the former residence of Polish kings that's now a regal art museum. So what, you may wonder, can a city that breathes so much of the old ever speak of the new? So very much, it turns out. Horse and carriage in Kraków's Old Town. I first visited Kraków as a child during the Communist era. 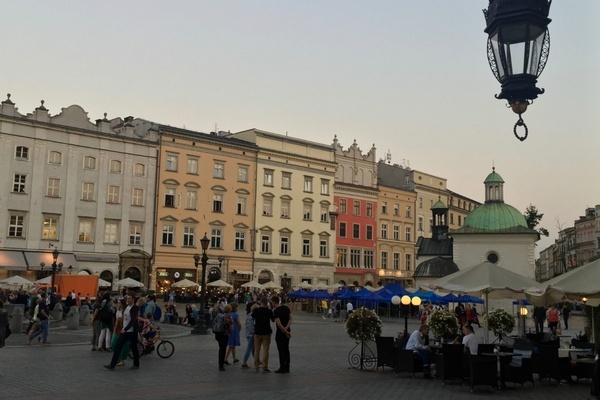 These family trips continued into adulthood, and, with every return visit, I found comfort in the scenes reminiscent of the city's history, as well as my own childhood: Rynek Główny, the main square, lined with terraced cafes. Market stands filled with fresh bouquets of long-stemmed sunflowers. Pigeons providing entertainment for playful children dressed in traditional Polish garb. Sukiennice (The Cloth Hall) exhibiting the handiwork of Polish artisans — amber jewelry, wooden dolls, and hand-carved chessboards. Church bells ringing from St Mary's Basilica as horse and carriage trotted by. 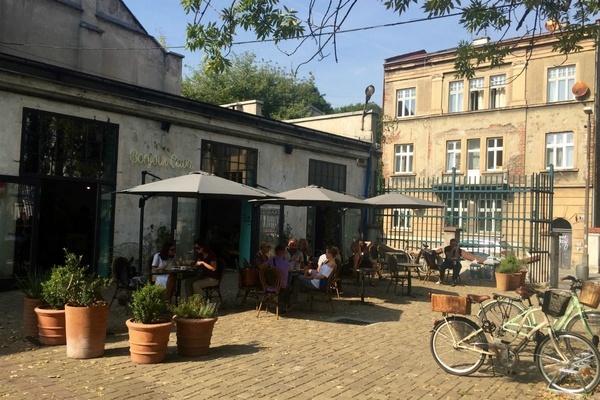 It wasn't until last fall that I began to look beyond the familiar cobbled paths that lead to centuries-old restaurants (Pod Aniołami, Wierzynek, Ariel) and bars hidden in restored bomb shelters (Café Camelot, Piwnica Pod Baranami, Stalowe Magnolie). What I discovered was a new Kraków that spoke more of the future than of the past. Getting from the airport to the city was my first introduction into this modern world. The new Airport Train departs every 30 minutes and connects to the city center in 17 minutes for a mere 8 PLN (less than $2). I will never again have to bargain for an overpriced taxi. I arrived at my stop at Galeria Krakowska, the shopping mall adjacent to Kraków's main railway station, and was impressed with the modernity and innovation of both. Everything appeared as I had left it in Rynek Główny, but exciting things were happening underground. The new museum Podziemia Rynku is a 3,300 square-meter archaeological and architectural exhibition that explores the history of Kraków and its people. Wawel Castle seen from the Wistula River. 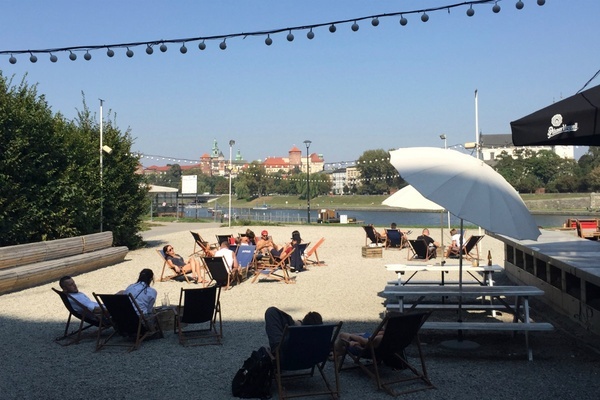 Beach chairs overlook the river at Forum Przestrzenie. Rather than make my usual stop to admire the Crown Jewels and other Gothic treasures at Wawel Castle, I continued past the hill along Vistula River towards the now abandoned Soviet-era Forum Hotel, which closed in 2002. I could feel the buzz as I approached Forum Przestrzenie in what used to be the hotel's lobby. One of the hippest locales to open in recent years, it's a scene, with dozens of beach chairs facing the river, rock-’n’-roll playing throughout, graffiti-covered walls, and a large retro area for food and drink. I ordered a club sandwich and fresh lemonade and felt like I was in Paris's Belleville or Brooklyn's Williamsburg. Was this still the same Kraków that served zapiekanki and Żywiec, traditional baguette-style pizza and local beer? Amazing. I left before the DJ set started. I continued along Ul. Dolnych Młynów to Zakłady Tytoniowe, a 19th-century tobacco factory that's been converted into a dozen trendy bars, cafes, and restaurants, including French-inspired Bonjour Cava and Międzymiastowa. They opened in August 2016 — and 40 more businesses are expected to open along with office spaces. My cousin, a student at Jagiellonian University (my mom's alma mater), and an older local friend invited me to join them at neighboring cocktail bars. I happily obliged. The industrial complex is the It spot for all ages: for family picnics and café dates by day and for a bustling singles scene by night. My last stop before retiring to the ultra-modern Radisson Blu (designed by a new wave of young architects, and conveniently located in the city center) was dinner with another friend at new vegetarian restaurant Glonojad. Food habits may be changing around here, but I still ordered my old favorite, pierogi.